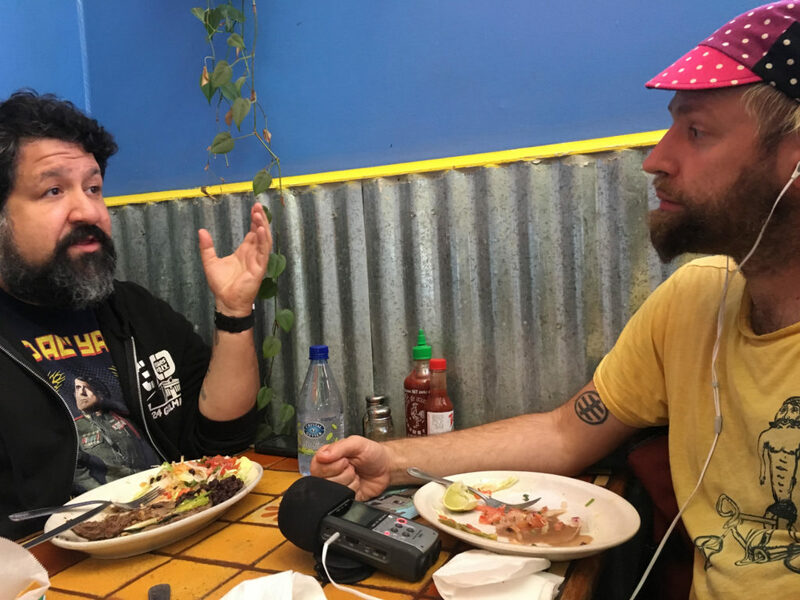 TURN IT AROUND excavates 30 years of the California Bay Area’s prolific punk past, highlighting Berkeley’s landmark 924 Gilman Street music collective and its community of bands, many of which also appeared on the roster of Lookout Records. It features original research and cool tellings of the history of bands like Jawbreaker, Operation Ivy, Green Day, and Rancid with lots of never-before-seen footage as well. Corbett (Bobby Joe Ebola Songbook, Meal Deal with the Devil) has been an entrenched part of this scene for decades and was chosen by Green Day (the executive producers) as the unique individual who could make all of the participants, scene, and fans happy—even though this is his first feature documentary! Aaron Cometbus did the lettering. Iggy Pop did the narrating. Jesse Michaels did the illustration. The film will be playing in Portland on August 3-4 at Cinema 21 and the national theatrical release is happening now! Corbett, Elly, and Joe sat down to talk about trauma, healing, and the importance of having a community to make you greater than yourself. 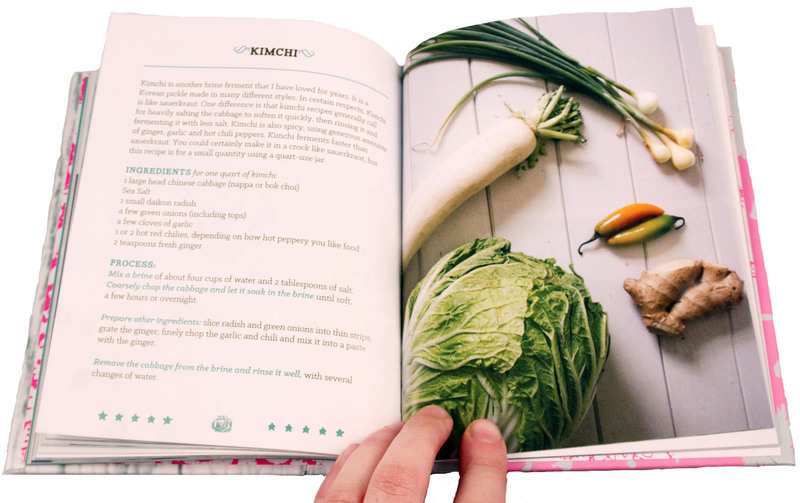 Fermented foods are great for your health, and this book is a great resource for learning to use the microbes around you. Wanna learn how to make your own? 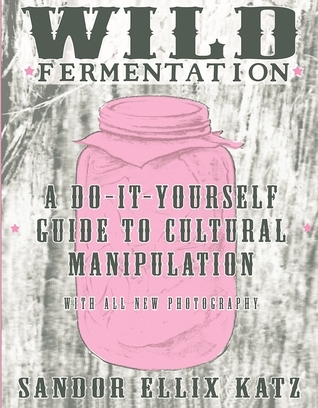 Previously available as the zine “Wild Fermentation,” this classic fermentation book needed an upgrade — and now with step-by-step photos and a lovely paper-over-board cover, it’s ready for new life! And, seriously, it’s beautiful. 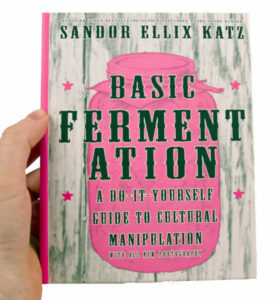 Officially out today and available at your favorite bookstore, Basic Fermentation explores the simplest ways to ferment at home, with delicious recipes for kefir, injera, honey wine, vinegar, and way more. And it’s officially out TODAY!! Enter to win a copy over on Goodreads, or buy one today from us and get it next week! Anxiety …. it’s the worst. Choking, stifling, smothering, tingling, panicking, brain cutting out, bad decisions… You’re a human being, so you know exactly what’s being said here. Dr. Faith lays it all out in her five-minute therapy zine: what anxiety IS (did you know that people wrote about it more in the 1800s than now? ), what it’s good for (that’s right, it’s actually a necessary response that helps to keep us alive in bad situations), how to know when it’s gone overboard, and practical tips on how to deal with anxiety when it gets bad. This zine is a lifesaver for panic attacks, breaking out of flight-or-fight-or-freeze responses, and for chronic anxiety. It’s also good for folks who aren’t burdened by anxiety daily but want to cope better with those tough life situations that affect us all. Read this and breathe! In the first comprehensive study of zine publishing, Stephen Duncombe explores the history and theory of subterranean cultural production. From their origins in early 20th century science fiction fandom, their more proximate roots in ‘60s counter-culture and their rapid proliferation in the wake of punk rock, Notes from Underground pays full due to the political importance of zines as a vital network of participatory culture, and analyzes how zines measure up to their utopian outlook in achieving fundamental social change. Packed with extracts and illustrations, Duncombe provides a critical overview of the contemporary underground in all its love and rage. Ever want to know what makes Microcosm tick? Now you can. To celebrate Microcosm Publishing’s 21st anniversary, the Microcosmonauts are putting together a new zine! To celebrate Microcosm’s 21 years in business, I want to produce the next piece of our story: a zine about the experiences and passions of the people that have made up Microcosm’s sweat, blood, and tears. I want to celebrate the people who have made Microcosm what it is now through good and bad, and to share our voices and all the reasons why we do what we do. The theme for this zine is BAGGAGE (We’ve All Got It). Because like any business, we are made up of folks who are people, and like all people, we’ve all got some kind of baggage. Emotional, psychological, physical, familial, legal, romantic; the list could go on, right? Who doesn’t have somethin’? In this zine collection of essays, articles, and art from Microcosmonauts past and present, we’re talking about our lives: our pasts, our passions, and our problems. What brought us here and what the hell keeps us going? 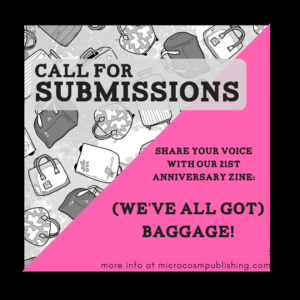 But for this to truly celebrate the people who make Microcosm what it is, we also need you.We wouldn’t be anything without all the zinesters, readers, and BFFs out there that keep us going. So tell us about you. How did you discover Microcosm Publishing? What draws you to our titles? What do you like about them or us? Has a Microcosm book or zine ever helped you through a problem or critical situation or led you on an adventure? What kind of baggage has something from Microcosm helped you to unpack, solve, or sort through? Has a zine ever gotten you through a panic attack, a bad hair day, or tough times? We’re looking for short personal essays, stories, mini-comix, or zine pages having to do with Microcosm, our books, our mission, what we do, etc. The theme we’re using to bring all of this together is (We’ve All Got) “Baggage”, so think about ways your work might reflect or fit into that theme. Some other questions you might consider if you’re interested: What do you think makes Microcosm unique, and why do you like it? What part of our mission or brand reflects or differs with your own personal values, perspectives, or identity​? What do you wish you saw more of? Deadline is August 1st, and submissions should be 300-1000 words (though feel free to submit art/other media) and can be as creative as the above call to action strikes you. Email me directly at Cyn@microcosmpublishing.com with questions and submissions. Include [BAGAGGE Submission] in your subject line. Thank you for keeping us going, and here’s to 21 more years of punk rock publishing. Tags: #weveallgotbaggage, 21st Anniversary, anniversary zine, make a zine with us!